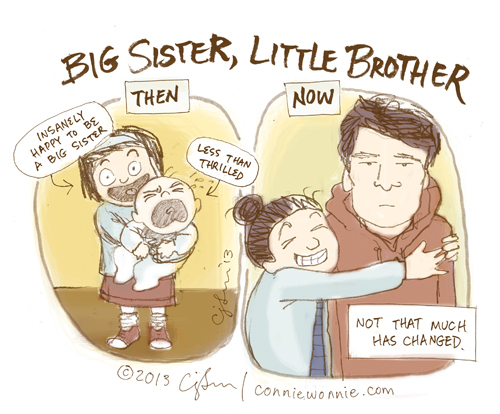 Dear Little Brother: When you were born, I thought that you were a present from Mom and Dad and that I owned you. Now that you're grown, I guess I should relinquish proprietary rights. But - you were the best present ever! I think this one is your funniest cartoon yet! My sister is like this. When I saw it, I laughed hard from knowing exactly what you mean! This one is my favourite! You can feel the way it's straight from the heart!